Your marketing strategy plan might include local TV, radio, and newspaper ads. That’s a great start, but all three of these types of ads can be expensive and may not give the best return on investment (ROI) if that’s all your septic service business is doing for marketing. Diversifying your marketing plan by using social media, direct mail, and local real estate connections will give you the best way to prospect for new business in the most effective way. Google: target people who are searching for your services – Google Advertising utilizes several types of personalized parameters to target potential customers for your business. Since Google’s main function is a search engine, it has incredible access to data regarding customers in your area who are already searching for your services. You can set up your advertising to be delivered to specific targets based on demographics, such as income, geographic locations, and home ownership. This ensures your ads are focused on useful leads. Google advertising also works on a cost per click basis so you are only paying when someone clicks on your ads and visits your website. Facebook: become the go-to industry expert – You can stay in front of your target market on Facebook by developing followers who rely on your company for the latest tech, information, and news about septic systems. Posting articles about your industry, your community, and offering tips regarding septic systems can show your followers you are the company to consult for questions or problem-solving. Posting testimonials of your great work, photos of your team in action, and teaching about proper septic maintenance can promote your credibility and create trust. Direct Mail: target people who recently moved – Once new home buyers finally move into their new home in your community, they need to find service companies in the area that they can trust. You can make sure they get your name early on by connecting with them within the first few weeks after they move by getting your info into their new mailbox. You do this by purchasing a new mover mailing list. It’s estimated new owners spend more on their home’s maintenance and repairs in their first 3 months than they might otherwise spend for the next 5 years. This is the time they find issues and/or develop maintenance schedules for their septic systems. Your mailing should share your Facebook Page and website info, as well as your phone number and some testimonials. Partner with realtors – Developing a good working relationship with local realtors can help out both of your businesses. Realtors deal with sellers who often need septic services, such as pumping and compliance certifications before they can sell. They also work with buyers who need to check out a new home’s septic system before they buy it. Loan services and some insurance companies require inspections, but septic systems can’t be evaluated by a garden variety home inspector. Realtors often help a new buyer find septic companies to do those inspections. In turn, you can provide the realtors with your trustworthy, great service. You’ll save them time and trouble in helping their clients. 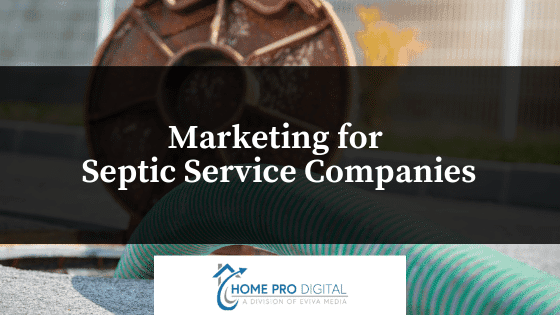 Home Pro Digital is great at helping septic service companies market their businesses. Contact us to find out how we can help with your marketing strategy.